My summer tires have arrived! Much excitement. I got a set of Vittoria Corsa G+ Clinchers in 700x25c as Competitive Cyclist was having a sale which included free Vittoria latex tubes (the pink ones). I was originally planning on getting some S-Works Turbo Cotton tires, but after reading a bunch of reviews I decided they were way too fragile for all-summer riding. The Corsa G Plus seems to strike a great balance between performance, rolling resistance, cornering, weight, and durability with the much-touted graphene layer as the hot new feature for 2016. Plus, I really love the look of tan sidewalls (gumwall). Apparently they feature "Kevlar reinforced Corespun K for increased sidewall protection" which sounds good. 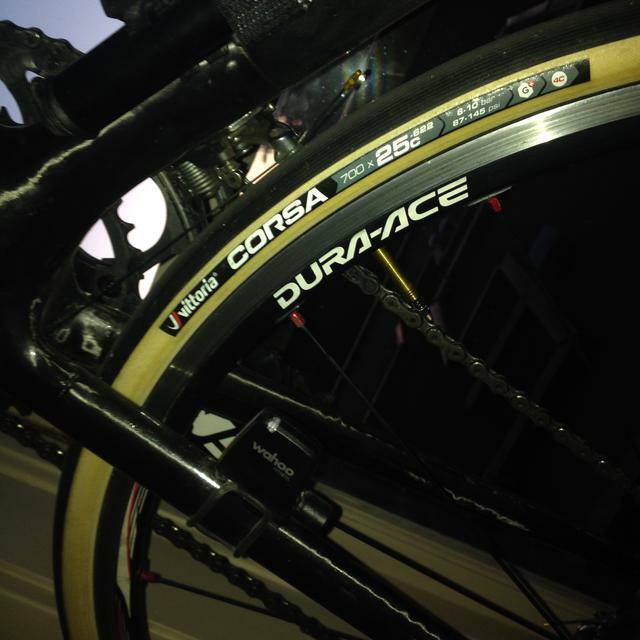 The tires and tubes went on my Dura-Ace 7850 SL Scandium alloy wheels without much difficulty. I checked the rim strip and inside of the wheel rim very carefully to ensure there was no cracks or sharp bits, and then took my time to ensure the latex tube was seated evenly inside the tire and not pinched anywhere. I did need a few applications of plastic tire lever to get the last bit of the Corsa over the rim, which is not uncommon with a brand new tire. These wheels are tubeless ready, which also makes tire fitment a bit tighter in some circumstances. It's pretty likely that after a bit of stretching on the wheel, I'll be able to get these tires on and off with my thumbs. I usually do a few inflate-deflate cycles on the tubes on a fresh install, in the hopes that it will straighten out any minor twists or bunching of the tube inside the tires. I didn't use any extra talc or anything, so we'll see how it goes. The only other experience I've had with latex tubes were the ones sealed inside my Challenge tubular tires. Wow, these tires roll fast! With the latex tubes, they feel very supple, almost as good at absorbing vibration than my 28c Pro4 Endurance tires at much lower pressure. Cornering feels great for being fresh out of the box - I took the hard right-hander on my local loop at full gas with no issues, and they were practically begging to go faster. The grip will probably get even better with a little wear down to fresh rubber. The longitudinal tread makes a different kind of sound than I'm used to (coming from Continental GP's previously), which will take a bit of getting used to, especially when the bike is leaned over. I think the tires are still getting used to their new inflated shape. Will report back as they break in. Any questions, just leave a reply below. Update May 2016 - I've put a few hundred km on these tires now, and couldn't be happier. The grip level is fantastic, I'm still pushing them further and further and haven't found the limit. No punctures so far, and pumping up the latex tubes every day isn't that much of a hassle with my good quality track pump.